This is used to monitor our children with chronic diseases and acute illnesses. The blood pressure cuffs and pulse oximeters allowed us to assist our medical community partners in gathering and reporting the blood pressure screenings often missed on physicals. Parents and staff can’t always tell if a child is having issues with their hearing or vision by observation alone, and children use all their senses to learn. Having the Spot Vision Screeners and the OAE Hearing Screener made the process of screening the children more effective and much faster. For example, the Spot Vision Screener takes 10 to 15 seconds to capture results from several children. Also, with the Spot Vision Screener parents are confident and excited for the results. The report has a photo of their child’s eyes with colorful easy to read results. A sizable number of Matrix Head Start children, 19%, have been diagnosed with asthma. Monitoring their oxygen levels is imperative to ensure they sustain healthy oxygen levels in an emergency. We are also able to check oxygen saturation in our children when necessary. At Matrix we are big on educating and training. Teaching everyone about handwashing with the handwashing kits brought awareness to the connection of improper handwashing and the spread of disease. It gave us an opportunity to train our staff, children and families on how to effectively wash their hands and cut down on the spread of germs. 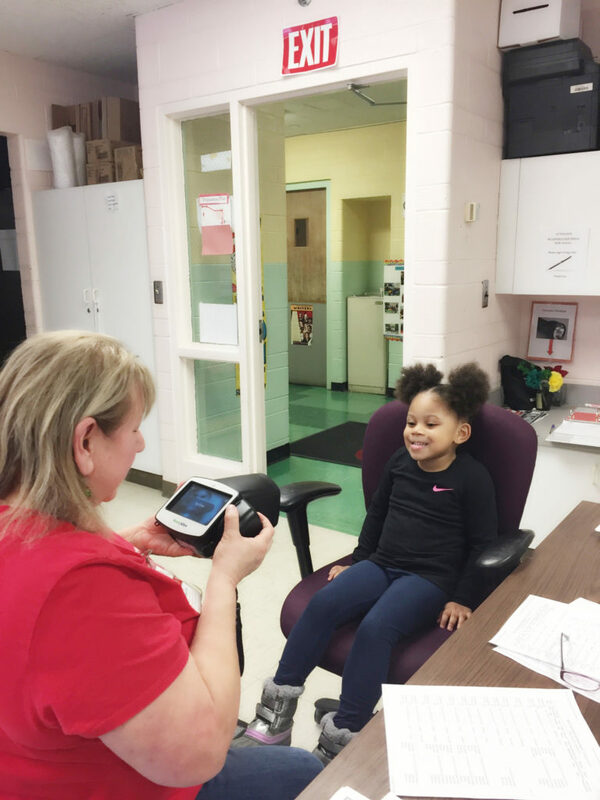 The collaboration of Matrix professional staff, including the School Nurse and students from Dorsey’s School of Nursing, served children in three distinct categories, and the children often overlapped into two or all three categories. Of those screened, 141 children were referred to an outside health provider for further evaluation, treatment, or other services. 1,294 children already had their blood pressure screened by their physician, leaving 288 children (21%) to be screened in-house with the new blood pressure equipment. The project’s success was evaluated by measuring completion of the required screenings for hearing, vision, and blood pressure within 45 days of each child’s enrollment. We were successful in having 100% of children screened within 45 days of enrollment, and completion rates ranged from 91% to 100% between 4 categories, which moved the program well above the national average of 84.5% completion (Office of Head Start PIR Indicator Report 2018 – National Level). Some unexpected challenges that affected the project were child absenteeism and families that did not provide consent for screening. We have reviewed and may adopt a research-based program that addresses absenteeism (Attendance Works!) and plan to step up parent education with the next school year.